Upon its initial 1997 release, the sci-fi film ‘’Starship Troopers” completely split audiences and critics. American film critic, Roger Ebert called it ‘’one-dimensional” and ‘’the most violent kiddie movie ever made.”, whilst others slammed it for being too childish or too raunchy and violent or both. To give some background, the film is loosely based off a military science fiction novel by Robert A. Heinlein, which was dubbed as an ‘‘ideologically intense” book by scholar Jeffrey Cass. The novel is said to be a promotion of the author’s own political views and his militaristic philosophy. It is possible that the author’s views that are quite prevalent in the novel could have influenced the audience’s expectations and reception for the movie, thus leading to the mostly negative reviews. 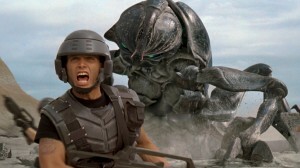 However, ‘’Starship Troopers” as a movie shouldn’t be compared to the book simply because of their many divergences. Now, twenty years later, some have come around to see that ‘’Starship Troopers” could possibly be one of the most misunderstood films, ever. On one level, the film could be taken as a cheesy action-adventure with quite an absurd plot that tells the story of young people in the next millennium. John ‘’Johnny” Rico (Casper Van Dien), following his girlfriend’s, Carmen Ibanez (Denise Richards), footsteps decides to join the Federal Service despite his parent’s disapproval. Carmen lives out her dream of becoming a pilot as she is sent to Flight School, and Johnny is assigned to the Mobile Infantry where he endures a gruelling boot camp. Just as Johnny’s about to quit, a species called the Arachnids, or simply, the Bugs attack Earth and people are rounded up to an interstellar war. And so, begins the action on the planet Klendathu where the Mobile Infantry combat the Bugs in a point-blank range. Putting this basic plotline aside and looking deeper, it’s obvious that the movie’s producer Paul Verhoeven, and writer Edward Neumeier, steer us down a more satirical route that calls out militarism, propaganda and fascist regimes. Just looking at Verhoeven and Neumeier’s film history, we should know the film shouldn’t be treated completely seriously as a simple action movie. After all, these are the people responsible for ‘’Robocop” that’s praised for its sardonic view of the future and society. From the very start, the movie depicts visual references to propaganda films and wartime news broadcasts. After every news story, we see a blinking cursor asking us ‘’Want to know more?”, leaving many unanswered questions about this warmongering world. The news stories are laden with militaristic and warlike attitudes and propaganda, showing young people with bright, toothy smiles as if in a toothpaste commercial, promoting the Federation. According to the film, being on the battlefield is what teaches personal values, and what earns you citizenship. We see the future is bleak for mankind as the theme of senseless violence, public torture and execution, and a strict military regime prevail throughout the movie. Perhaps the reason why many took this movie so seriously, was the fact that the satire is so easily embedded in the film, that it’s barely noticeable amongst the already ludicrous plot and action sequences. It’s not a movie that purposefully tries to be funny or accentuates the comedic or satirical parts, you’re just expected to know better than to fall into the trap of taking everything at face-value. For me, the first few seconds seemed to be a very clear jab at military propaganda films, showing a futuristic war sequence that jumps into a military recruitment video. There are many parts that seem so sweetly sardonic, for example, when the new recruits proudly state why they joined the forces – to be a politician, a writer, to do their part for their country. Later, they are picked off like flies, with only the strongest left standing. The battle sequences continue this surreal, propaganda-laden message as soldiers run into a mismatched battle on a planet that’s ridden by Bugs, who instinctually just jump and kill. The soldiers charge, guns blazing and firing round after round at creatures that just keep on coming. If we were to look at this film from a completely serious perspective, it makes us ask – How can a society that seems to be so tech-advanced not think of a more practical and safe way of defeating alien Bugs than throwing some kids down with military rifles and no backup plan? It just feels redundant – though that is the intention. Paul Verhoeven, in his commentary on the DVD edition of the film, states that the movie’s message is “War makes fascists of us all”, and that the movie is a satire of American militarism, whilst Ed Neumeier agrees, although he applies this satire to the whole of human history. After watching this movie, it’s safe to say its main message can still easily be applied to society today. Tensions are high in the world, and it is often unclear which side is the victim and which is the aggressor – much like the Bugs and the humans in the film.